^ Yeoman, 2008, p. 28. ^ 2.0 2.1 Yeoman, 2008, p. 222. ^ Burdette, 2005, pp. 98–101. ^ Yeoman, 2008, p. 221. ^ U.S. House of Representatives, 1969, pp. 3, 40. ^ U.S. House of Representatives, 1969, p. 1. ^ 10.0 10.1 Public Law 91–607. ^ Julian, 1993, p. 2851. ^ Bailey, 1974, p. 9. ^ 13.0 13.1 U.S. Senate, 1978b, p. 30. ^ 14.0 14.1 Ganz, 1977, p. 205. ^ U.S. Senate, 1978b, p. 110. ^ Caskey & St. Laurent, 1994, pp. 497–498. ^ Ganz, 1976, p. 54. ^ Julian, 1993, p. 2929. ^ 19.0 19.1 19.2 19.3 Ganz, 1976, p. 55. ^ Ganz, 1976, pp. 55–56. ^ Ganz, 1976, p. 56. ^ U.S. House of Representatives, 1978, p. 13. ^ 23.0 23.1 U.S. House of Representatives, 1978, p. 2. ^ U.S. Senate, 1978a, pp. 1–2. ^ Logan, 1979a, p. 46. ^ U.S. House of Representatives, 1978, p. 7. ^ U.S. Senate, 1978a, pp. 5–6. ^ U.S. House of Representatives, 1978, pp. 36–37. ^ U.S. House of Representatives, 1978, pp. 104–106. ^ U.S. House of Representatives, 1978, p. 107. ^ U.S. House of Representatives, 1978, p. 97. ^ 32.0 32.1 32.2 Reiter, 1979a, p. 116. ^ Reiter, 1979a, pp. 116–117. ^ 34.0 34.1 34.2 34.3 Reiter, 1979a, p. 117. ^ Martin, 2010, pp. 224–225. ^ U.S. Senate, 1978a, p. 2. ^ Yeoman, 2008, p. 224. ^ 40.0 40.1 Carter, 1979, p. 1737. ^ Reiter, 1979b, p. 46. ^ Reiter, 1979b, p. 48. ^ Reiter, 1979b, pp. 48–50. ^ 44.0 44.1 Reiter, 1979b, p. 50. ^ Stevens & Ganz, 1979, p. 33. ^ Hackel, 1979, p. 25. ^ Julian, 1993, p. 2931. ^ 48.0 48.1 Martin, 2010, p. 225. ^ Wolenik, 1979, p. 8. ^ 50.0 50.1 Ganz, 1979, p. 44. ^ Schwager, 2014, p. 60. ^ 52.0 52.1 52.2 Logan, 1979b, p. 42. ^ U.S. House of Representatives, 1979. ^ The San Bernardino County Sun, 1979, p. C-5. ^ 55.0 55.1 55.2 55.3 55.4 55.5 Yeoman, 2008, p. 225. ^ 56.0 56.1 56.2 Reiter, 1981. ^ 57.0 57.1 Julian, 1993, p. 2932. ^ 58.0 58.1 58.2 58.3 Roach, 2010, p. 22. ^ 59.0 59.1 Public Law 105–124. ^ Roach, 2010, pp. 22–24. ^ Gilkes, 2008, p. 82. ^ Yeoman, 2008, pp. 225–226. ^ Krause, 1999, p. 64. ^ Yeoman, 2008, pp. 224–225. ^ Krause, 1999, pp. 64–65. ^ Schwager, 2014, p. 61. Bailey, Clement F. Ike's Dollar — The Successful Failure. COINage (Encino, California: Behn-Miller Publishers). 1974-09, 10 (11): 8–10, 94–100. Burdette, Roger W. Renaissance of American Coinage, 1916–1921. Great Falls, VA: Seneca Mill Press. 2005. ISBN 978-0-9768986-0-3. Carter, Jimmy. Public Papers of the Presidents of the United States. Administration of Jimmy Carter. Washington, D.C.: Government Printing Office. 1979. ISBN 0-16-058934-7. Caskey, John P.; St. Laurent, Simon. The Susan B. Anthony Dollar and the Theory of Coin/Note Substitutions. Journal of Money, Credit and Banking (Columbus, Ohio: The Ohio State University Press). 1994-08, 26 (3): 495–510 [2015-04-26]. JSTOR 2078014. Ganz, David L. Our New Small-Size Dollar Coins. COINage (Encino, California: Behn-Miller Publishers). 1976-10, 12 (10): 54–58, 114–115. Ganz, David L. Toward a Revision of the Minting and Coinage Laws of the United States. Cleveland State Law Review (Cleveland State University). 1977, 26: 175–257. （原始内容存档于2015-04-24）. Ganz, David L. The Selling of a Coin. COINage (Encino, California: Behn-Miller Publishers). 1979-10, 13 (10): 44–46. Gilkes, Paul. Die trials, experimentals, patterns test coin metals. Coin World (Sidney, Ohio: Amos Press). 2008-06-02, 49 (2512): 82–84. Hackel, Stella B. Annual Report of the Director of the Mint. Washington, D.C.: Government Printing Office. 1979. Julian, R.W. Bowers, Q. David, 编. Silver Dollars & Trade Dollars of the United States. Wolfeboro, New Hampshire: Bowers and Merena Galleries. 1993. ISBN 0-943161-48-7. Krause, Barry. Anthony dollar gaining respect. Coins (Iola, Wisconsin: Krause Publications). 1999-06, 46 (6): 64–65. Logan, Charles. The Search for a Dollar. COINage (Encino, California: Behin-Miller Publishers). 1979-07, 13 (7): 40–46. Logan, Charles. The Anthony – Who Goofed?. COINage (Encinco, California: Behn-Miller Publishers). 1979-10, 13 (10): 42, 101. Martin, Erik. Anthony dollar hits wrong chord with collectors, public. Coin World (Sidney, Ohio: Amos Press). 2010-06-07, 51 (2617): 224–226. Reiter, Ed. Gasparro's Greatest Challenge. Coins (Iola, Wisconsin: Krause Publications). 1979-02, 26 (2): 116–117. Reiter, Ed. Judging the Anthony Dollar. COINage (Encino, California: Behn-Miller Publishers). 1979-04, 13 (4): 46–50. Reiter, Ed. Numismatics; What Will Become of Those Anthony Dollars?. New York Times. 1981-10-11. （原始内容存档于2015-04-24）. Roach, Steve. Wanted: new $1 coins (as long as they're not Anthony dollars). Coin World (Sidney, Ohio: Amos Press). 2010-03-08, 51 (2604): 22–24. Schwager, David. The Anthony Dollar 'Orphan'. COINage (Dallas, Texas: Beckett Media). 2014-08, 50 (8): 60–61. Stevens, Larry; Ganz, David L. Minting the Anthony Dollar. COINage (Encino, California: Behn-Miller Publishers). 1979-02, 13 (2): 33–35, 104. Stevenson, I.K. Date on New Silver Dollar Uncertain. Sarasota Herald-Tribune. 1964-12-13. The San Bernardino County Sun. 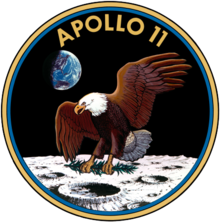 Lewis — dump new dollar coin. The San Bernardino Sun. 1979-07-15. United States Congress. Public Law 89–81 (PDF) (PDF). 1965-07-23 [2015-04-24]. （原始内容存档 (PDF)于2013-12-02）. United States Congress. Public Law 91–607 (PDF) (PDF). 1970-12-31 [2015-04-24]. （原始内容存档 (PDF)于2013-10-06）. United States Congress. Public Law 95–447 (PDF) (PDF). 1978-10-10 [2015-04-24]. （原始内容存档 (PDF)于2014-04-13）. United States Congress. Public Law 105–124 (PDF) (PDF). 1997-12-01 [2015-04-24]. （原始内容存档 (PDF)于2014-04-26）. United States Department of the Treasury. The Joint Commission on the Coinage (PDF) (PDF). 1968-02-29 [2015-04-24]. （原始内容 (PDF)存档于2015-04-24）. United States House of Representatives. The Coinage Act of 1969. Washington, D.C.: Government Printing Office. 1969. United States House of Representatives. Proposed Smaller One-Dollar Coin. Washington, D.C.: Government Printing Office. 1978. United States House of Representatives. H.R. 4783. Washington, D.C.: Government Printing Office. 1970. United States Mint. 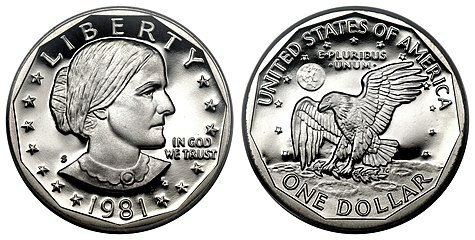 U.S. Mint to Strike 1999 Susan B. Anthony Dollar Coins (新闻稿). 1999-05-20. （原始内容存档于2014-08-10）. United States Senate. The Susan B. Anthony Dollar Coin Act of 1978. Washington, D.C.: Government Printing Office. 1978. United States Senate. 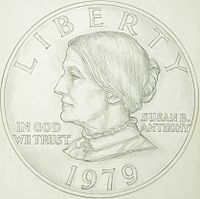 Susan B. Anthony Dollar Coin Act of 1978. Washington, D.C.: Government Printing Office. 1978 [2015-04-24]. Wolenik, Robert (编). First Check-Up on the Anthony Dollar. COINage (Encino, California: Behn-Miller Publishers). 1979-08, 13 (9): 8. Woo, Elaine. Frank Gasparro, 92; Chief Engraver at U.S. Mint. Los Angeles Times. 2001-10-03 [2015-04-24]. （原始内容存档于2015-04-02）. Yeoman, R.S. Kenneth Bressett, 编. A Guide Book of United States Coins 62nd. Atlanta, Georgia: Whitman Publishing. 2008. ISBN 978-079482491-4.